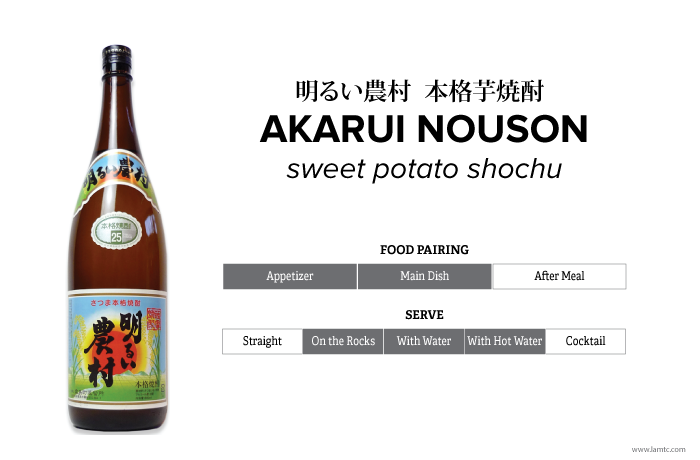 Many avid shochu drinkers in Japan swear by this sweet potato Shochu –Akarui Nouson, distilled by Kirishimacho Jyoryusho, the smallest Shochu distillery in former Kirishima-city, Kagoshima. The brand, Akarui Nouson, derived from their belief: “Quality Shochu is made from quality soil and quality soil is only found in the lively agricultural village” represents their diligence in creating their product. This shochu has been prepared in inherited traditional, hand-made clay pots using the most purest ingredients grown in the beautiful nature –locally harvested Koganesengan sweet potatoes, rice and spring water from Mount Kirishima. Enjoy the well-rounded, plump aroma and flavor of sweet potatoes.